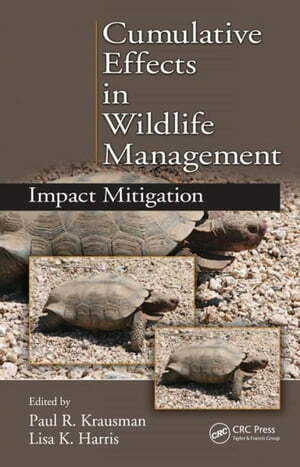 Collins Booksellers - Cumulative Effects in Wildlife Management: Impact Mitigation by Krausman, Paul R, 9781439809174. Buy this book online. As humans continue to encroach on wildlands, quality and quantity of wildlife habitat decreases before our eyes. A housing development here, a shopping mall there, a few more trees cut here, another road put in there, each of these diminishes available habitat. Unless the cumulative effects of multiple simultaneous development projects are recognized and incorporated at the beginning of project development, we will continue to see wildlife habitat disappear at unprecedented rates. Divided into two parts, Cumulative Effects in Wildlife Management emphasizes the importance of recognizing cumulative effects and highlights the necessity of their bearing on future policy. It begins with an outline of the differences between direct, indirect, and cumulative effects of anthropogenic impacts on wildlife habitat and addresses the similarities and differences in US and Canadian policies, legal and economic ramifications, and the confusion that stems from lack of consideration, communication, and forward planning. Section 1 also describes the current standard means of quantifying cumulative effects as proposed by the Council on Environmental Quality. Section 2 presents a series of case studies that deepen our appreciation of how anthropogenic influences interconnect and how this heightened level of understanding influences our ability to make informed decisions. Case studies include cumulative effects in the Canadian Arctic, border issues with Mexico, suburban and exurban landscapes, scenic resources, and the cumulative impacts of energy development on sage-grouse.